You are not the only one that has to make tough decisions while away from home, such as whether or not to order the salad or the cheeseburger, the water or the soda. When your kids leave for school they face a number of challenges, particularly as they get older and are exposed to more food choices throughout the day. If you want to help them make smart choices, there are a number of things you can do that will not only help keep their bodies healthy, but can also help keep their smiles healthy, as well. Since balanced nutrition is an essential part of a healthy smile, helping set the standard for good food choices is one of the best ways you can help your kids develop and maintain healthy smiles. First, kids of all ages look to their parents for cues about what is important. From the items you serve them at dinner, to your own attitude about oral care, they are going to watch you because your actions speak much louder than words. By making smart decisions yourself, you can set a good example which will help guide them to choose a healthy lifestyle, themselves. 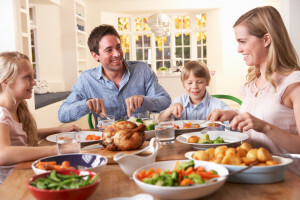 Make sure to serve well-balanced meals, at home, so your kids can develop a taste and appreciation for vegetables, fruits, lean proteins and dairy products (which can be great for teeth). This will make them much more likely to choose healthy options when they’re on their own. Don’t rely on simple starches or sugary items to fill their plates or their lunch pails. Sugar is the leading cause of cavities, so try to limit its presence in your diet. Enlisting your kids’ help with cooking can be a great and fun way to teach them about nutrition. You’ll also want to make sure your children brush their teeth each morning and night. When they’re very young, you’ll need to assist them. But you can also brush your teeth in front of them, so they learn proper technique. You can even make it a fun family tradition by playing a song as you brush your teeth, together. Don’t forget to schedule bi-annual checkups and cleanings for your kids, as well, to help keep their smiles healthy as they grow.